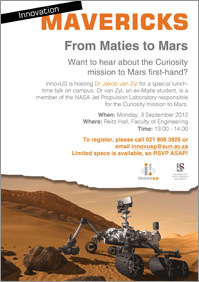 Dr Van Zyl will be the speaker at a special Mavericks event, hosted by InnovUS at Stellenbosch University. He will share his experience of the preparations involved in the Curiosity mission, as well as the subsequent successful landing of the nuclear-powered rover. Limited space is available, so RSVP ASAP!